It's that time of year, guys. The school year burnout is starting to creep in, and you might just find yourself day dreaming of summer vacation and midday margaritas (or is that just me?!). Is anyone else feeling it? I'll admit, I decided to write this blog post to also remind myself how to get out of that mid year funk. Below you will find some of my top tips for avoiding (or at least decreasing!) teacher burnout. I used to be really bad about this. I would be at work until 6:00, take work home with me, and then do it all again the following day. 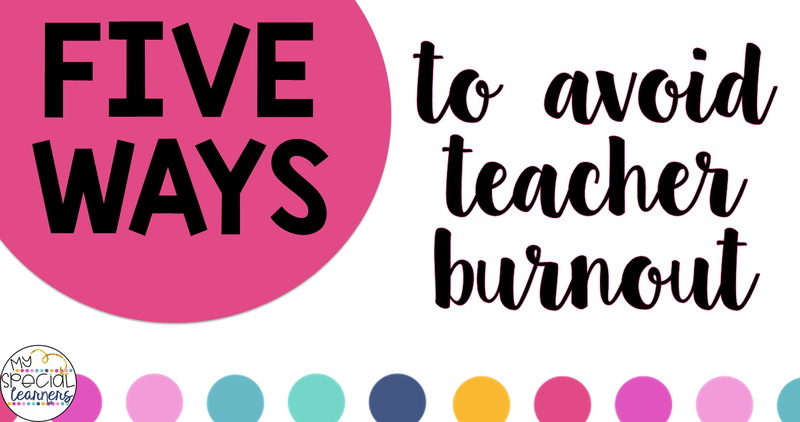 Yes, in the beginning of your teaching career this might be necessary once or twice a week. However, I believe it is SO important to leave school shortly after your students leave to give yourself that time to decompress for the next day. The work will always be there, no matter how many hours you spend in your classroom! 2. Do something nice for YOU. This sounds simple, but it's amazing how much we give to others and not ourselves. Make sure you do something every day for your well being. Whether it's reading a book, going for a walk, getting in a good workout, or getting a manicure. Do something that will make you happy and help you relax! 3. Write down something positive from every day. My friend Melissa at Autism Adventures gave me this wonderful idea. Every day, write down something funny or inspiring that happened at work that day. Keep a journal throughout the year and look back on some of the hilarious or amazing things your kiddos did each day when you're having a tough time! I love this idea and am definitely going to be putting it into practice this year. 4. Use your sick days! I don't know about you, but my sick days I've accrued in the last 4 1/2 years in my district are somewhere in the 40's. I rarely use my sick days, especially when I'm actually sick! You have sick days for a reason, USE THEM. Not only when you are sick, but also when you're feeling burned out. Your students will thank you later when they have a well rested and happy teacher! Take a mental health day, do something you love (whether it's a spa day or the entire day in your PJs with Netflix on TV), and don't feel bad about it for a single minute. Ok, this MIGHT sound like a negative way of dealing with burnout. However, I don't care who you are, who doesn't benefit from a countdown?! Whether it's a countdown to Spring Break, a fun event, or the ultimate countdown: days til summer, this always makes me feel better! (Unless you're counting down to summer in October, that might make you a little depressed.) I'd be lying if I didn't say I had a countdown to summer written in my calendar and whip it out and check the number whenever I'm feeling extra exhausted. I kind of love it.